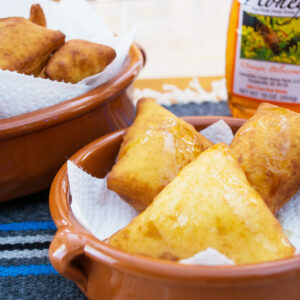 Soft pillows of fried dough drizzled with honey. These are a traditional New Mexican treat. Combine flour, salt, baking powder, and sugar in a bowl. Cut in shortening until mixture looks like coarse meal. Stir in the milk with a fork until it comes together in a moist dough. Form into a ball and knead several times. Let the dough rest for 30 minutes. Roll out the dough on a lightly floured surface into an ⅛” thickness. Heat oil to 375ºF in a deep pan. Fry the dough (2 or 3 at a time, at the most) turning often until golden on all sides. This should take place very quickly, about 30 seconds. Remove the cooked sopaipillas from the oil using a spatula and drain on paper towels. Repeat frying the rest. Drizzle with honey and serve immediately.